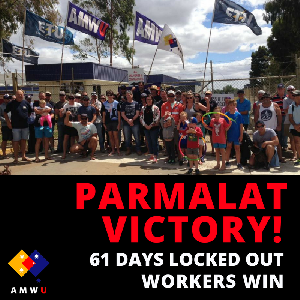 Lactalis/Parmalat have lifted their 61-day lockout and withdrawn proceedings to terminate the existing enterprise bargaining agreement after the Australian Manufacturing Workers Union and the Electrical Trades Union struck a new agreement with the company which strengthens protection against precarious work. The company was seeking more flexible provisions to hire agency workers but direct hire employment will now apply to all workers including casual workers. The engagement of maintenance contractors will remain subject to consultation with the union in line with previous practices. Union rights have been protected and extended in the new collective bargaining agreement. The three year agreement provides for annual wage rises at or above the rate of inflation and a 'sign on' bonus which will assist in compensating workers for the time they were locked out. The IUF affiliated AMWU expresses its heartfelt thanks for the international solidarity and practical support received through the long days of a difficult lockout.